Screenshot (.png) of HTML piece by Chris Ashley, from his blog. 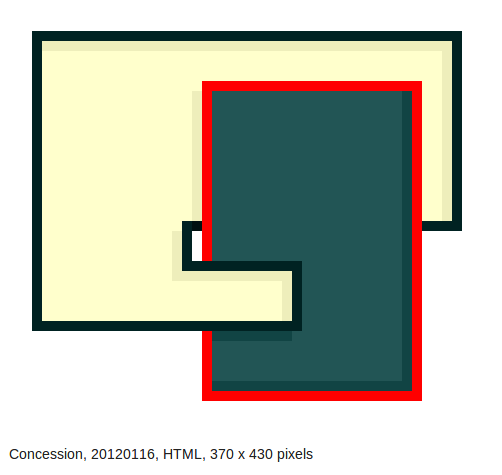 Posted on Jan. 16, 2012 and captioned as: "Concession, 20120116, HTML, 370 x 430 pixels." The caption is included in the screenshot to preserve some sense of the spacing. The white area around the colored rectangles shrinks and grows with the browser width; it was captured with the minimum padding allowed by the browser. My blog formatting adds more padding. I have some older Ashley pieces posted where the HTML is no longer reading correctly; I've emailed Ashley to see if we can (or should) reconstitute those. HTML, the people's coding medium, is clearly on its way out the door in the current era of web developer dominance. HTML became shaky for "blog art" almost from the outset, because different browsers, PCs, and CSS design schemes seemed to render it differently. Ashley's pieces aren't hand-coded, in the sense of typing out table instructions for where the colors go. Originally he used Dreamweaver, a WYSWYG editor. Not sure what he's using now (he's still posting the drawings) or if it matters. Update: Ashley notes via email that "the drawings are made with code and that despite using Dreamweaver [MX] these are not generated files ...but are mostly handmade, or hand-drawn."